Passengers waited as a commuter rail train pulled into the North Beverly station in Beverly last week. The MBTA will not resume regular service on its commuter rail lines until sometime in March, officials said Monday, delivering bad news for the tens of thousands of people in Greater Boston who rely on the trains to get to work in the city. The forecast appeared less dire for people who ride the city’s subways. 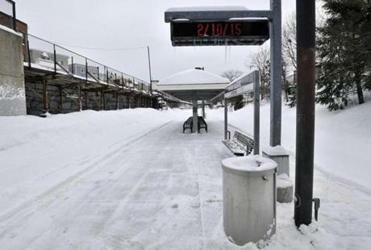 By Monday, the T had reopened all the subway lines it had shut after a Valentine’s Day weekend snowstorm, including the Mattapan trolley line, which was initially scheduled to reopen on Friday. “We got the real estate back, if you will, in terms of the lines,” said Beverly A. Scott, the general manager of the Massachusetts Bay Transportation Authority, adding that the embattled transit system has made “unbelievable progress” in returning to normal. But Scott also acknowledged riders would still suffer through more delays and crowded trains. Although the Red and Blue subway lines are running the number of trains needed for regular service, a T spokesman said the Orange and Green lines will not be able to return to a normal schedule before March. The subway and commuter rail systems have been walloped by the second-snowiest winter on record, which has brought nearly 100 inches of snow to Boston. MBTA general manager Beverly Scott said that the T is rethinking its policy on not giving refunds for bad service. Because of the poor service, T officials are reconsidering their no-refunds policy, and will present a final recommendation on refunds March 11 to the Massachusetts Department of Transportation board of directors. Mac Daniel, a spokesman for Keolis, the French company that runs the commuter rail, said the date for full recovery for that rail service could be “sometime in March.” When pressed for a more exact date, he declined to provide one. “We’re keeping things vague until we get a better handle on how fast the repairs are going, and how quickly,” Daniel said. Daniel said the commuter rail is still operating with 69 percent of the locomotives necessary for regular service. 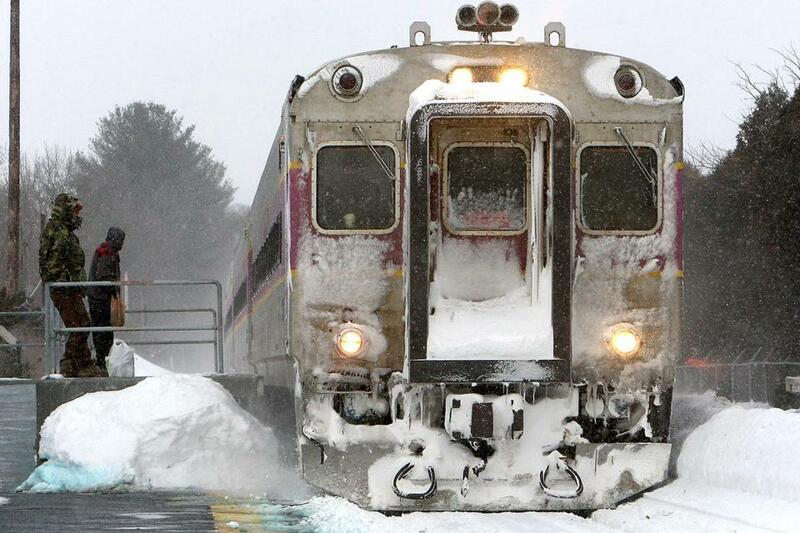 So far, only 35 percent of commuter rail trains ran on time in February, according to numbers released by the Department of Transportation. Last month, about 82 percent of the trains ran on time. Governor Charlie Baker, who publicly chastised the company last week for its poor service, said during a Monday news conference that he had spoken on the phone with Bernard Tabary, the chief executive officer of Keolis. Baker said he expects that the two will meet in Boston soon. Tabary “apologized for the performance and said it was not up to company standards,” Baker said. Baker last week announced he would convene a panel to look into the MBTA’s management and finances. Hoping to have a say before the panel concludes its work, Thomas Murray, president of the local chapter of the Transport Workers Union of America, which represents Keolis employees, sent a letter on Feb. 23 requesting a meeting with Baker. Murray said a shortage of suitable maintenance facilities and “a lack of leadership between the MBTA and Keolis right now” have contributed to poor performance of the commuter rail. Commuters on certain lines have suffered from particularly dismal service: Last week, less than 23 percent of the trains on the Needham and Stoughton lines ran on time during the evening commute. Only about 45 locomotives in the fleet are running, compared to the 65 typically available for regular service, according to Daniel. He said the company is awaiting the delivery of about 10 traction motors on Wednesday, which will allow crews to repair some of the trains. The company has been challenged by the “sheer acreage” of the maintenance facilities that needed to be cleared of snow, the Keolis spokesman said. “The snow was getting so bad that the trains were unable to reach their morning run destination because they were slow to get out of the maintenance facilities,” Daniel said. Meanwhile, the MBTA’s subway system on Monday operated the highest number of trains since Feb. 9. Service for the B branch of the Green Line and the entirety of the Braintree branch of the Red Line was restored on Sunday, a day ahead of schedule. But service has still been sporadic: The Green Line had only about 83 percent of the cars needed to provide regular service, and the Orange Line had about 77 percent. Last week, Scott had said the T might need as many as 30 days to get back to normal. But T officials have said they are working feverishly to restore regular service more quickly. Scott abruptly announced on Feb. 11 that she will be stepping down in April, and gave little indication of her reasons. Her contract was set to run until December. On Monday, she said she was resigning for personal reasons. She said she had promised her granddaughter two years ago that she would share her high school years with her. During Thanksgiving, Scott said, her granddaughter reminded her of that pledge. “At that point,” Scott said, “I knew that I would not conclude” 2015 as head of the MBTA. Officials will conduct a search for a permanent replacement, but Transportation Secretary Stephanie Pollack has said that the Transportation Department board of directors hopes to have an interim general manager in place before Scott leaves.